Ceramic car coatings are an extra layer of protection, lasting years rather than months with traditional products (waxes, sealants, etc.). The main purpose is to guard and protect the vehicle from environmental fallout (bird droppings, dirt, bugs, tree sap) and improve the overall condition of the paint. It creates a hydrophobic and antistatic layer on the surface so that dirt, dust, even raindrops will not stick to the exterior in most cases. Not to mention, ceramic car coatings add a fabulous gloss to the paint. We use ceramic car coatings to add layers to the exterior paint to help protect it, since when paint is initially applied at the factory, it is only 3.5-4.5 mils thick, varying slightly depending on the manufacturer. If you were to hold a Post-It note between two of your fingers, that is the average thickness of the paint that comes stock on a majority of vehicles (3.5 mils, including the base coat, color coat, and clear coat on top!) Therefore, that is the level of protection your vehicle has. Scary, right? The thin layer of clear coat on top is designed to be a strong coat of “sunblock” that lasts for a few years before your paint starts to oxidize and show major signs of wear and tear from car washes and environmental fallout. On the left hand side of the picture below, the paint has been neglected, and has major wash marring and oxidation. 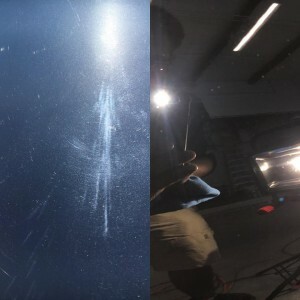 The picture on the right shows the process of a multi-step paint correction that brings the paint back to life. By correcting paint, we are removing bits of the clear coat, lessening the protection on the car even more. This is ultimately the purpose of a ceramic car coating. Waxing can be a temporary solution to this problem. Wax is a very thin layer that is not durable and is not measurable on a paint gauge, unlike a ceramic car coating, and therefore does not protect your vehicle against environmental fallout. With ceramic car coatings, your vehicle gains more protection and extra perks (like the awesome gloss!) than it would with a wax. Wax needs to be applied at least 4-6 times a year, depending on the use of the vehicle) in order to fully protect a vehicle from the sun. Ceramic car coatings are applied once a year at max, depending on the name brand. The most durable ceramic car coatings can last 5+ years (as close to a permanent protective barrier as one can get). 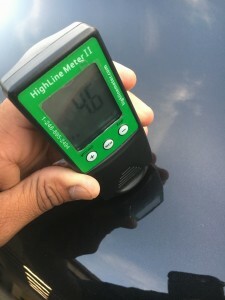 This difference in ceramic car coatings protecting paint is measurable by means of a handheld gauge (pictured below) that can be held to various areas of a vehicle to assess the thickness of the paint. We decided to experiment; we measured the paint on a stock car (a car that had no extra protection). After applying a simple wax, we measured the paint again, and there was no change in the thickness; the levels were the same, and there was no added protection with just a wax, essentially working as a tanning lotion would work for your skin. 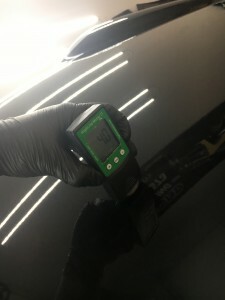 However, with a ceramic car coating, when measuring the paint thickness, we found that the thickness increased, thus confirming the effectiveness of a ceramic layer of actual protection. All in all, ceramic car coatings have incredible benefits: your car will stay cleaner longer, your car will be protected from leaves, staining, UV rays, water spots, and the list goes on! For a cool video on nano-ceramic car coatings, click the link below, and the results will speak for themselves. Your car is an investment that deserves the best protection possible, and a ceramic car coating is a grade-A barrier that will help keep your vehicle clean and damage-free. If you have any questions about ceramic car coatings or are interested in getting a personal quote on your boat, RV, or vehicle, please don’t hesitate to contact us!